A new pamphlet was issued during 2013. Describe the safety precautions you should take when handling and caring for a horse. Describe the fire safety precautions you should take in a barn and around horses. Name the 15 main parts of a horse. Name 10 parts of the saddle and bridle that you will use, and explain how to care for this equipment. 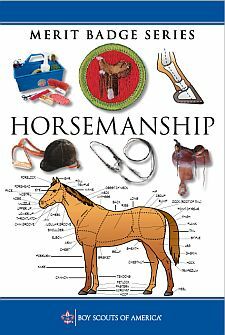 Show how to properly saddle and bridle a horse. Demonstrate how to safely mount and dismount a horse. Walk the horse in a straight line for 60 feet. Walk the horse in a half circle of not more than 16 feet in radius. Trot or jog the horse in a straight line for 60 feet. Trot or jog the horse in a half circle of not more than 30 feet in radius.